This delicious baked swordfish recipe with tapenade, leeks, and red peppers combines gorgeous colors and robust flavors. Best of all, it's easy and virtually foolproof to make. Cook rice, and you have a complete dinner. We use swordfish steaks for this recipe - usually just 1 or 2 steaks cut about 1 inch thick. When we serve this family-style, we usually leave the pieces whole so that everyone can take as much as they want. Alternately, cut the steaks into serving-sized pieces before cooking. There's really only one word for the olive tapenade: fabulous! Not only does it have a wonderful flavor, but it keeps the swordfish moist and meaty while it bakes. As a bonus, you can use this green olive tapenade recipe as a topping for all kinds of other things: pork loin, chicken breasts, tuna steaks, salmon filets - or use it to flavor soups or even as a quick pasta sauce. Cut the leeks lengthwise and wash them carefully in a large bowl of water to remove any grit. Slice lengthwise to make thin strips (see photo), and then crosswise to make pieces about 1 1/2" long. Lay the olives out on a chopping board or other hard surface. Use the flat side of a heavy knife blade or even the bottom of a coffee mug to lightly smash each one. The pit will pop right out! Make the green olive tapenade by putting the olives, dill, onions, nuts, garlic, cayenne or black pepper, and olive oil into a food processor. Pulse 5-6 times until all ingredients are finely chopped. Don't pulse too many times, or you'll make a paste. Use a spatula to scrape down the sides of the bowl, pulse 1-2 more times. You should have about 3/4 cup of tapenade. Prepare the swordfish for baking by spreading a spoonful or two of the green olive tapenade on the bottom of a baking dish, and laying the fish on top of it. Spread the remaining tapenade over the top of the swordfish. Arrange the leeks and red peppers around the swordfish. Drizzle them with another 1-2 tablespoons olive oil, if you want. 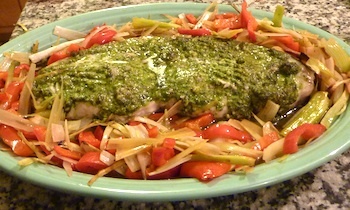 Bake the swordfish with tapenade and veggies at 425°F for about 15 - 20 minutes, until the swordfish is cooked through. Cooking time depends on the thickness of the fish. After 15 minutes baking time, test the swordfish with a fork. Once it becomes opaque and flakes fairly easily with a fork, it is done. If you want, stir the vegetables gently to keep them moist. Serve this baked swordfish recipe with tapenade on a platter, surrounded by the leeks and red peppers. Tip: If you double or triple the recipe to serve more guests, add additional baking dishes to give the vegetables plenty of room.